Ann Arbor Police have arrested a man who could be the person responsible for two violent, unprovoked attacks on young women Saturday night. Lieutenant Aimee Metzer tells 7 Action News that the first assault took place just before 9 pm inside the Starbucks located on the 200 block of South State Street in downtown Ann Arbor. ANN ARBOR, Mich. (WXYZ) — Ann Arbor Police have arrested a man who could be the person responsible for two violent, unprovoked attacks on young women Saturday night. 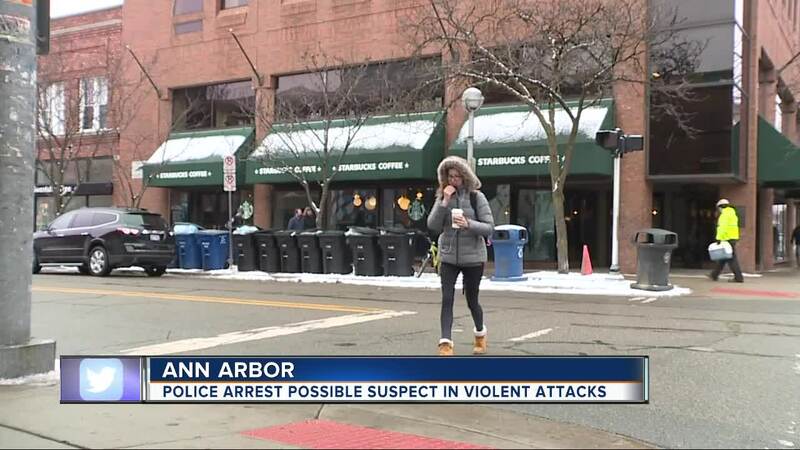 Lieutenant Aimee Metzer tells 7 Action News that the first assault took place just before 9 pm inside the Starbucks located on the 200 block of South State Street in downtown Ann Arbor. The victim is an 18-year-old University of Michigan student. Witnesses said the man seemed to be fixated on her, moving from seat to seat until he was close enough to pick up a chair and strike the young woman over the head with it. He managed to get away. Then at 10:30 pm, about a mile away, at West Park on Chapin Street near West Huron, police believe the same man attacked a second woman. That victim, a driver for Uber and Lyft, was outside of her vehicle taking a smoke break when a man came up behind her and began punching her 12 to 15 times. The woman was able to pull out some mace, spray it and escape. Ann Arbor Police were in the early stages of their investigation when officers were called to an apartment complex on Plymouth Road near Bishop where a suspicious man had been found sleeping in a laundry area. Metzer says that man matched the physical description of the attacker. The man took off running but officers were able to apprehend him. Right now, police are only calling him a person of interest, but he could soon be charged and named as the suspect.